Let’s just say it’s been a whirlwind… It started with the installation, then the exhibition, meeting some of the local makers (two of my sisters flew in for the show), running the panel discussion, and finally, the de-installation. Phew. Here are some of the behind-the-scenes moments you might have missed…and did I mention the bootie haboob? 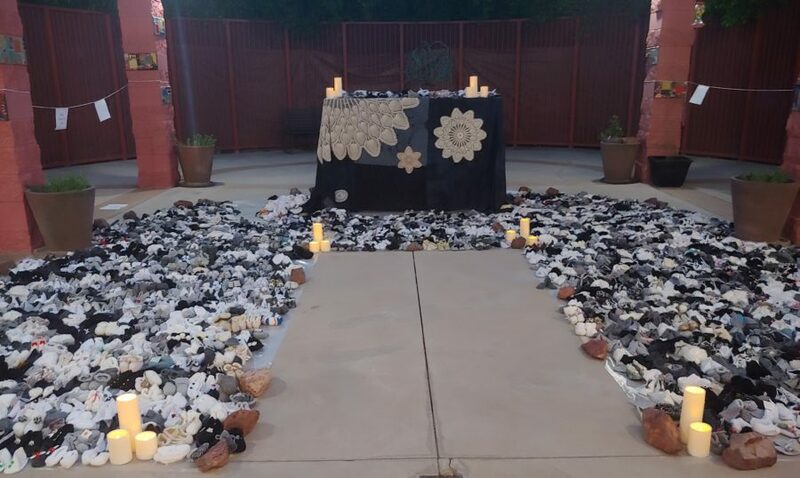 This first exhibition, at the YWCA of Southern Arizona, was an outdoor installation. (Note: for reasons that will soon be clear, I am re-thinking any future outdoor installations). Little Elegies would be in a large courtyard surrounded on three sides by brick and mortar, and on one side (the west side) with a steel security fence. 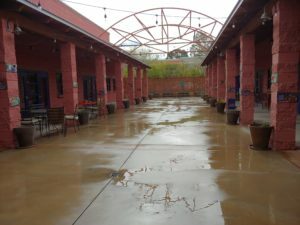 YWCA courtyard, in the rain. 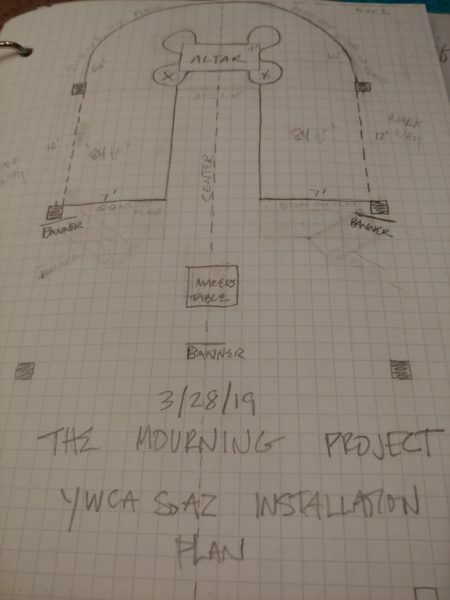 Installation plan for the first exhibition of The Mourning Project. I checked the weather forecast to see that the maximum winds predicted were 13 mph. Not exactly a storm, more like a gentle breeze. I researched fences online that would act as a wind break. There were none available in Arizona. I would have to order them, and they would arrive after the opening of the exhibit. I decided to punt and use duct tape and drop cloths if needed to keep the booties from going airborne. Paper booties were filled with coins to weigh them down. Ceramic booties helped to weigh down aspects of the installation (like the altar cloth) and stabilize them. Late on Friday afternoon (March 29), we completed the installation. 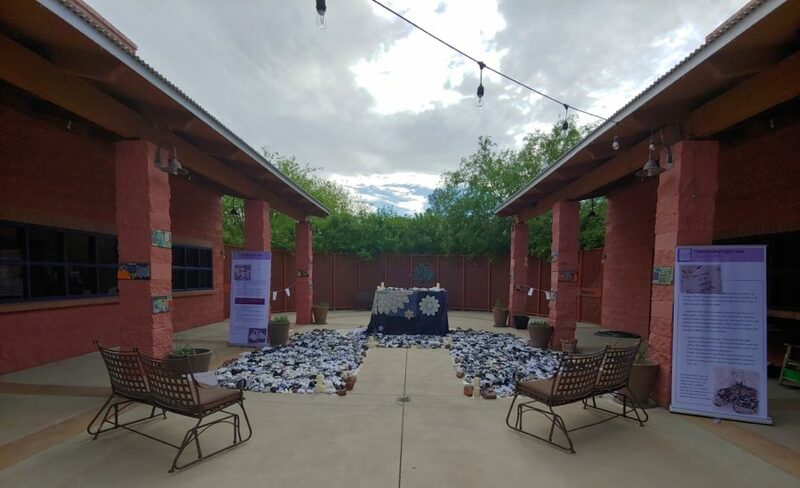 The awesome installation team of Mitch Anderson, Ana Martinez, Kathleen Koopman, Janet Windsor, Valerie Galloway put it together in under 4 hours and it looked great. The question was, would it stay that way until Tuesday morning when the show opened? Click here for a link to Dan Buckley’s cool time lapse video of the installation. When I arrived at 9:00 sharp on Tuesday, all was just as we had left it (we had secured the booties and rest of the installation with vinyl drop cloths and heavy rocks). It looked like I was home free, and the installation was ready for viewing at 9:00 a.m. The Little Elegies installation, all wrapped up for the night. It looked the same when I arrived on Tuesday morning. The wind came in from the west, directly into the courtyard, and I realized that the focal point of the installation was surrounded on three sides by the screen fence. 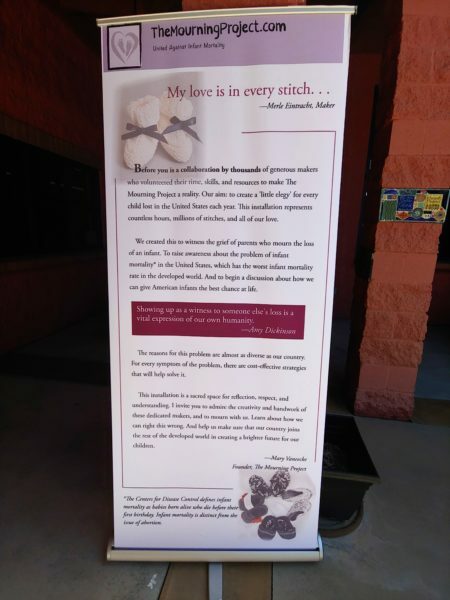 So I covered the installation about an hour early, and went home to figure out plan B.
I had dinner that night with my husband and sister Kathleen AKA The Knitting Machine and told them the problem, that I needed ‘something with grommets’ to attach to the fence with zip ties and screen the wind. They had both used plastic tarps in the past and we headed over to a local hardware store and found just what we needed, in gray. The next day, The Knitting Machine and I moved the entire installation 20 feet east, where it was better protected from the wind. Then we installed the tarps behind the existing fence. All on Wednesday morning, before the winds picked up again. It was so great to have Kathleen there to help. She sure knows how to whittle down a To Do List, and she’s fun to hang out with, too. Thursday was busy with preparation for the panel discussion. Panelists Bonita Katz of the International Childbirth Education Association, Stacie Wood, TMC’s Perinatal Safety Officer, and Laura Vargas, March of Dimes Advocacy Fellow gave great presentations on how we can begin to make improvements in our infant mortality rate. Click here for an edited video of the discussion and learn more about the problem. Friday morning we had a bunch of local makers in for a photo shoot with the installation. Stay tuned for a picture of that. In the meantime, here are some views of the installation throughout the week. Scroll down to see some of my photos of the installation. 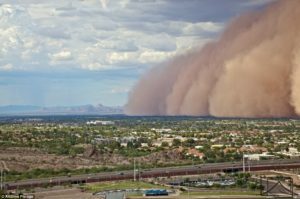 And then you can read about the BOOTIE HABOOB. There are three banners that accompany the installation. This one describes the installation, and the other two discuss the problem of infant mortality. A rare view of the full installation with clouds. Banners designed by Janet Windsor flank the installation. We added booties to the installation every day as makers came to see the installation. 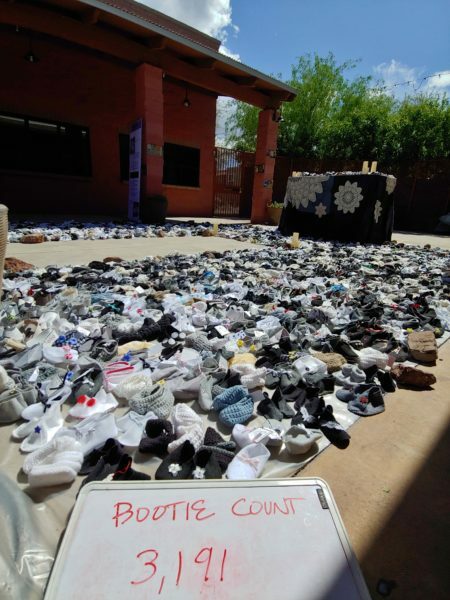 This shot shows the bootie count as of Thursday evening. At takedown, it was 3,223. Detail of a corner of the altar cloth. The cloth is made of vintage handworked linens that were over-dyed and collaged together. It is patched in the Japanese boro style. Maker Merle Eintracht’s quote is embroidered on a vintage baby dress. Crochet work is overlaid over the base cloth, which includes many hand-embroidered, pieced, and applique textiles. My favorite view of the installation, at dusk, by candlelight. My sisters Nanci (left) and Kathleen (right) came in for the installation. 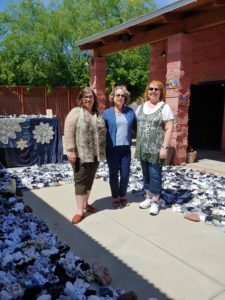 Together, they have made about 500 pairs booties (so far!). So, all of that happened, and Friday passed without windy incident. 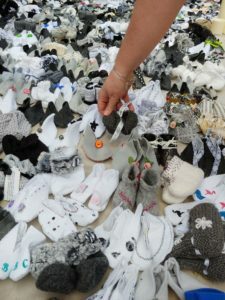 Until about 4:00 on Friday, the exhibition over, and it was time to start collecting the booties. The sky had started to darken. By 4:30, half of the booties were packed. 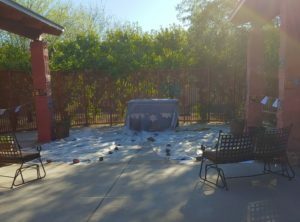 Then a HUGE gust of wind came from the east, behind and up and over the building, and it swept a whole bunch of booties around the altar and up against the fence. It happened in about two seconds. And I so wish I had video of the bootie haboob to show you, but you will just have to imagine 1,500 booties tumbling in the wind. It was just one hellacious gust, and we (JK, Nanci, Kathleen and I) scrambled to collect them all. No harm was done. All the booties were collected and undamaged. I have a better idea to hold the booties down IF there is another outdoor installation. Do you see your booties in these photos? Please make some more! Make them black, white, and gray, knit, sewn, or crocheted. Be sure to send in your booties by Mother’s Day, May 12, and we will extend the deadline if necessary. 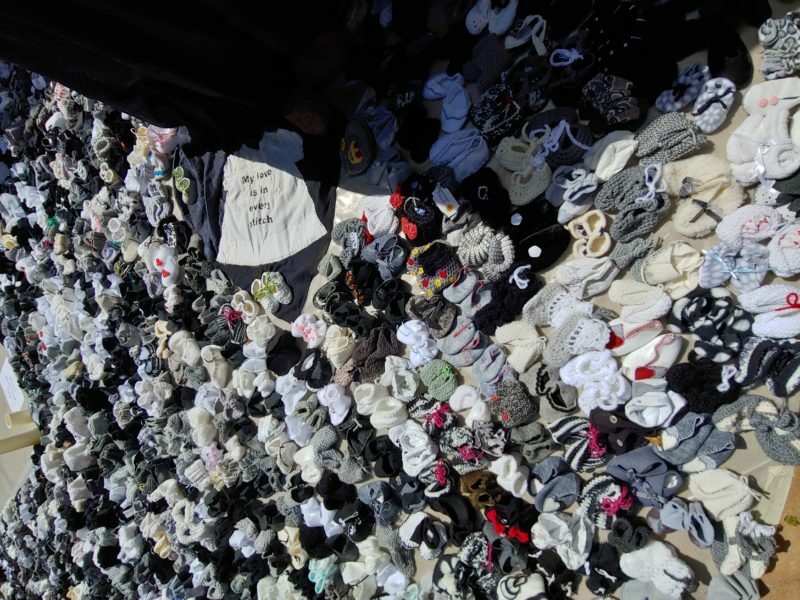 We still need 20,000 more pairs to honor each American baby who dies each year. I know you will want to be a part of this important project. And thank you to all the makers who have submitted booties to date! The Mourning Project is possible with you. PS–Watch this blog and our Facebook page for professional photos of the exhibition. I’ll be using those to apply to different venues for the exhibition around the country. If you have an idea about where we should apply, let me know! I was very moved to see the altar, with the candles, and then the impact of the tremendous volume of booties hit. And to realize that many more pairs will continue to be created. The panel discussion was informative and heartfelt, with the presenters adding personal stories and perspective to the reason for this community art project. Well done. I’m eager to see where it will travel. That was exactly what I was going for, Gerry. Thank you for all your support of this project.